The 11th IEEE International Conference on Global Software Engineering (ICGSE 2016) brings together researchers and practitioners to share their findings and experiences in addressing the challenges of globally distributed teams. Global Software Engineering challenges result from distances of various kinds, including cultural, linguistic, and dispersion over time and space. These distances affect the different practices of software engineering leading to the need for new empirical studies, techniques, tools, and practices from many disciplines. ICGSE 2016 will focus on how the challenges of Global Software Engineering are being addressed and resolved within the different practice areas such as requirements, design, construction, testing, maintenance, process, methods, management, etc. We invite both academic and industrial communities to contribute to this flagship conference in global software and IT. ✹ Research papers that describe theoretical frameworks, technical solutions, or empirical studies. Maximum length 10 pages. ✹ Industry papers that describe problems, lessons learned, solutions implemented, challenges encountered, and case studies on industrial global software engineering environments. Maximum length 5 pages. ✹ Short papers that can describe: (i) new ideas: a single, thought-provoking, and well-defined idea at an early stage of investigation, without necessarily a full evaluation; or (ii) work-in-progress: papers to disseminate on-going work and preliminary results for early feedback. The main evaluation criteria will include the demonstrated or argued novelty and originality of the idea/work, the clarity of the description, the relevance to the themes of the conference, potential impact, technical soundness, appropriate comparison to related work, as well as some preliminary evidence of the feasibility of the idea/work. Authors of accepted papers will be invited to present both a short lightning talk on their research and a poster at the conference. Short papers should conform to the conference format and must not exceed 5 pages, including all text, figures, references and appendices. 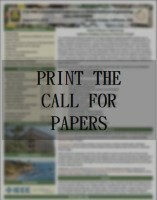 Papers should be submitted as PDF files which conform to the ICGSE 2016 Format and Submission Guidelines (IEEE formatting, US Letter, two-column size). Accepted papers will be published in the proceedings by IEEE CS Press and the IEEE CS Digital Library. At least 1 author of each accepted paper must register for the conference and present the paper in person at the conference or the paper will not be included in the proceedings and will not be visible in online indexing systems. Additionally, we invite submission of proposals for workshops and tutorials, and submissions for the doctoral symposium. Further information will be available soon.